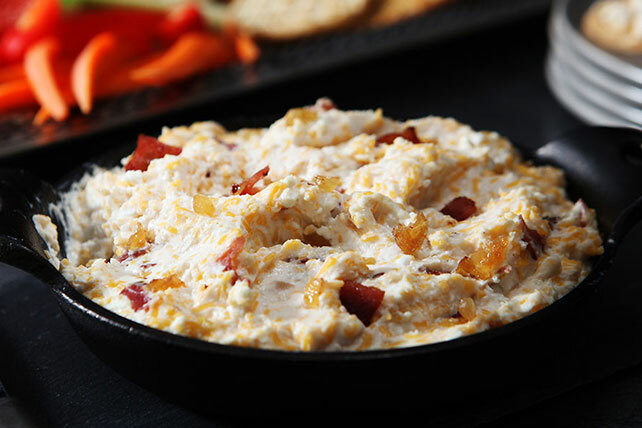 Spread it on with Neufchatel cheese, cottage cheese and cheddar cheese in our Cheese-Bacon Spread. This Cheese-Bacon Spread recipe calls for turkey bacon. Cook bacon and onions in small nonstick skillet on medium heat 3 min. or until onions are lightly browned, stirring frequently. Remove from heat. Beat Neufchatel in medium bowl with mixer until creamy. Add cheddar and cottage cheeses; mix well. Add bacon mixture, Worcestershire sauce and garlic powder; mix well. Spoon into small baking dish sprayed with cooking spray; cover. Serve with assorted cut-up fresh vegetables, whole wheat woven crackers and/or pita chips.